Firearms on campus, fuel prices and foreclosures, five years of war and seven years of Washington shenanigans. There's not a lot to laugh about these days. But laugh we must, and this season brings a plethora of high-caliber talent north of the bridge. From unannounced appearances by Robin Williams to live tapings of TV specials featuring George Carlin and Dana Carvey, comedy is flourishing. Joking was always big in my house, from whipped-cream fights over dessert to making my younger sister's friends crack up so hard that milk would spray from their little noses. My first live professional comedy experience came when I was in the eighth grade. My best friend, Ruder (he was the kind of kid who always got called by his last name), and his mom invited me to join them to see Bill Cosby perform at the University of Kansas. We set out for the 40-minute trip from suburban Kansas City with plenty of time to catch the earlier of the two shows scheduled for the evening—it was, after all a school night. Mr. Cosby was very funny; at the time, he was the biggest comic star in America. He left the stage to a standing ovation, and, as if returning for an encore, came back to the microphone and somberly announced that Martin Luther King Jr. had been assassinated. The second show was cancelled, and the performer jumped on a plane and immediately flew to Atlanta to be with Coretta and the kids. Mrs. Ruder nervously escorted us back home. Are comedy and tragedy two sides of the same coin? Marin comedian Mark Pitta thinks so. "Ed McMahon tells a story about Johnny Carson. He was doing a sketch about Abraham Lincoln. He had the stovepipe hat, the beard, the mole on the face, the whole deal. Well, the sketch bombs, they go to commercial and Johnny says to Ed, 'Too soon.'" On the other hand, Pitta, who hosts a weekly improv and sketch show every Tuesday night at Mill Valley's 142 Throckmorton recalls being on the bill with Smokey Robinson just three days after 9-11. "We were debating whether to do it or not. The audience was so hot that night, it was cathartic, they were laughing so hard at things that weren't supposed to be. They needed to laugh. It was odd." While TV sitcoms featuring standup comedians as stars—Seinfeld, Tim Allen, Ray Romano—have started to disappear from the tube, live comedy has come back. "There was a time you couldn't turn on your TV without some comedy special," says Marc Gurvitz, manager for Carvey, Bill Maher and Dennis Miller. "The big names now [have the luxury of] picking and choosing a venue and my guys just love the room," he says of Santa Rosa's Wells Fargo Center. "It feels intimate, and the audiences are great." "Sonoma County audiences are grateful these artists are here," says Rick Bartalini, programming director for the venue. "They can experience the performance close to home." Indeed. North Bay resident and Saturday Night Live alum Dana Carvey changed the venue of his upcoming HBO taping from New York to Santa Rosa. One reason: the audience. "They're smart, well-read and not cynical. They remind me of [the folks in] Minneapolis," Carvey says. But with better weather. Carvey is on his cell, driving through Mill Valley on a sunny afternoon. He too mentions his fondness for the Wells Fargo Center. "It's like I'm in the wheelhouse, the way the balcony wraps all the way around." Although attending one of the broadcast-bound shows at the Wells Fargo Center has a bit of a Hollywood vibe, there are strict guidelines sent to every audience member. For the recent George Carlin live feed, seat holders were instructed to arrive early, pick tickets up at will call 90 minutes before showtime. Forty minutes before the curtain went up, the lobby bar closed, and everyone had be seated a half hour before Carlin took the stage. And once seated, you had to stay there. God forbid you have to pee. But, as Mark Pitta would like to remind you, the Wells Fargo Center is not the only room in town. You never know who you might see at his Tuesday-night soiree. Carvey has been working out the material he'll use in Santa Rosa, as has Robin Williams, who showed up at the Mill Valley theater recently to try out jokes for his USO trip to Afghanistan and Iraq. "The show is always called 'Mark Pitta and Friends,'" Pitta emphasizes. "The philosophy behind that is we don't try to get people in the door because of a specific headliner. All the other clubs have to, they need to get the butts in the seats. We don't know who's gonna be there. So people just come to laugh, and they don't care who they see. If they do see Richard Lewis or Dana or Kevin Pollack or Robin, it's gravy. If they don't see somebody 'famous,' they still see a great show." But the big names are the draw. "Two thousand eight will likely have more comedy than prior years," Bartalini says. "It's certainly shaping up that way." Catching a big name, especially a fellow North Bay neighbor, has its advantages. 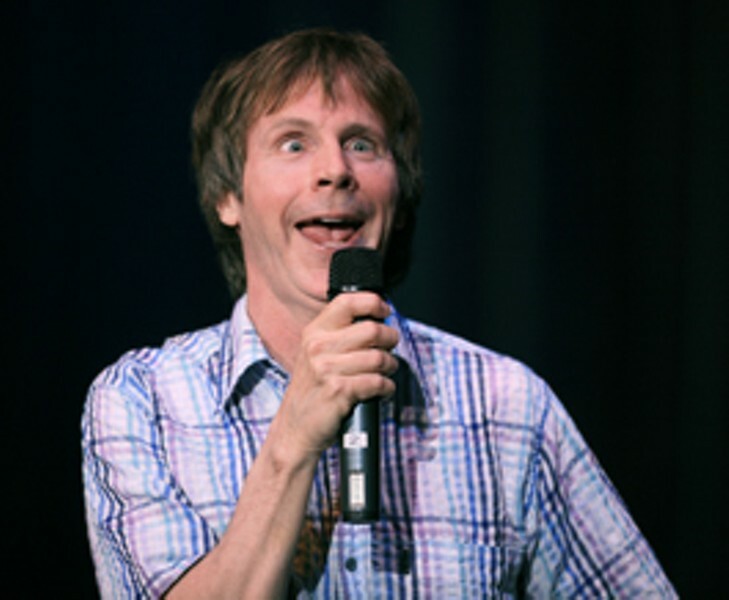 "I do a twenty-minute bit on Sebastopol," Dana Carvey says. "It doesn't play anywhere else. Nobody else gets it." There are other opportunities to catch live comedy. Here is a peek at some upcoming gigs.Dana Carvey holds the house at the Wells Fargo Center for two nights, taping his new TV special. Friday&–Saturday, March 28&–29, at 7:30pm, no joke. $15&–$65; only standing-room tickets available. Radio hosts Bob & Tom bring their Comedy All-Stars Tour through with Kristi Lee, Donnie Baker, Bob Zany, Ralph Harris, Nick Griffin and Tim Bedore on Friday, April 4 at 7:30pm. $33.75. The 14th annual Pride Comedy Night, starring Suzanne Westenhoefer, whose own sense of pride comes in part from working unscripted. The traditional dancing and music in the lobby follows this popular event for the LGBT community and beyond. Saturday, June 14, at 8pm. $25&–$35. Wells Fargo Center, 50 Mark West Springs Road, Santa Rosa. 707.546.3600. The Best of the San Francisco International Stand-Up Comedy Competition carpets the North Bay, hosted by Mark Pitta and featuring headliner Paul Ogata and other alumni of this prestigious 32-year-old event. Wednesday, April 9 at Sonoma State University Cooperage, 1801 E. Cotati Ave., Rohnert Park. 8pm. $10; SSU students, free. 707.664.2382. Saturday, May 3, at the Napa Valley Opera House, 1030 Main St., Napa. 8pm. $35. 707.226.7372. Mark Pitta hosts ongoing Tuesday-evening laff-fests with established comics and up-and-comers every week at 8pm. $15&–$20. Look for a special Mark Pitta and Friends event on Saturday, April 5, also at 8pm. 142 Throckmorton Theatre, 142 Throckmorton Ave., Mill Valley, 415.383.9600.The Mystic Theatre hosts the Four Bitchin' Babes on Saturday, April 26, a musical revue that is emphatically not standup, but sounds like a lot of fun for the over-40 set anyway, as four musically inclined performers riff on marriage, kids, social mores, PMS and, of course, clothes. 23 Petaluma Blvd. N., Petaluma. 8pm. $25. 707.765.2121. The Pachecho Playhouse occasionally hosts standup, as with their March 14 "Comedy Night." Check www.pachecoplayhouse.org for possible further fun in May. Also under the radar are the sometimes shows hosted at Mary's Futons. The next one is tentatively slated for June 8 (that could change) and will probably feature the ladies of Kung Pao Comedy, helping to raise monies for the Spectrum Center for Lesbian, Gay and Bisexual Concerns. Mary's Futons, 4100 Redwood Hwy., San Rafael 415.472.2919.